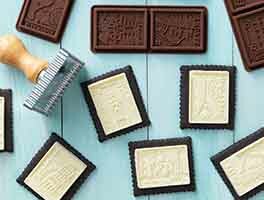 Nothing could be more festive on the holiday table than a tray of these, buttery, confectioners' sugar-dusted, jam-packed cookies, created by blogger Alexandra Stafford at Alexandra's Kitchen. The hint of lemon in the dough nicely complements any number of fillings, from raspberry jam to lemon curd. To make the dough: Beat the butter, sugar, and zest until light and fluffy, scraping the bowl as needed, about 3 minutes. Add the yolk and vanilla and beat until combined. Meanwhile, whisk together the flour, almond flour, and salt. Add the flour mixture to the egg mixture and mix until just combined. Don't over-beat. To assemble: On a lightly floured surface, roll one disc of dough out about 1/4"-thick. 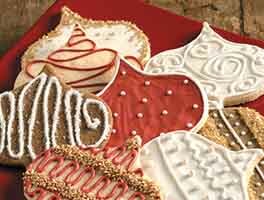 Using a 2 1/2" round cookie cutter, cut out cookies. Transfer rounds to a parchment-lined baking sheet. Gather the scrap dough, roll, and repeat. Place the cut cookies (you should have 12 cookies) in the refrigerator for 30 minutes. To bake: Bake all of the cookies for 8 to 10 minutes, or until the edges are just beginning to turn brown. Let them cool for 5 minutes on the pan, then transfer to a rack to cool completely. I won my office's Battle of the Cookies with this recipe. I used key lime curd for the filling (it was a St. Patrick's Day theme). They were an unexpected sweet/tart/salty taste and they were a true hit! I've been asked to share the recipe a number of times since yesterday's contest. Key: make sure to use the parchment... it makes all the difference in the world. For me this was a 3 day process. I made the dough one evening. I cut and baked the next evening. I filled and served the next day. Every single cookie in the 2 batches came out perfectly. Now I wish I had made more... no leftovers here. I was a little apprehensive about making these after reading other people's feedback but was pleasantly surprised - these cookies were no more work than you'd expect a double decker cookie to be. And well worth the extra effort. I replaced the almond flour with an equal amount of rye flour. The dough seemed dry but after letting it warm up, it was easy to work with with a little rye flour on the counter. I will definitely be making these again. Delicious! I'm not an expert baking cookies but I had no issues, used parchment paper to roll the dough as others suggested. I made them into hearts for Valentine's Day. Can't wait to make them again! After reading the reviews, I was almost afraid to try rolling these! However, I remembered a trick from baking tiny gingerbread pieces for some mug houses I made last year: I rolled out the dough on a very well floured piece of parchment paper, and took care to generously flour the dough as well. I cut out my circles, then removed the excess dough around them and transferred them to a cookie sheet. This helped quite a bit. I was a bit worried about how crumbly the dough seemed before refrigeration and after leaving in the fridge for 2 days instead of 1 hour I was even more so. Luckily I worried without need. After letting the dough come back to room temperature (a very cold room), I quickly kneaded it and rolled it out. It cut without a problem and the cookies turned out beautiful and delicious. With my 2 1/4 inch linzer cookie cutter I ended up with 36 cookies after doubling the recipe. I didn't have any lemons so I zested an orange instead and love the flavor it adds. I will definitely be baking this recipe again and again. I have been on a baking binge and made these for a cookie platter to take to work. These were the most popular item on the platter. I didn't have any trouble rolling out or cutting. They are in my list of cookies to do again. 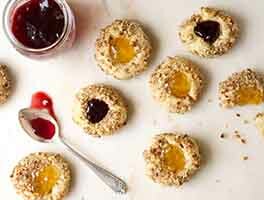 So these made excellent thumbprint cookies because the dough isn't a cut-out friendly one. I had to add an extra cup of flour while trying to roll it and also put in 1/4 corn starch to try to stabilize it while still in the mixer. Tastes great but too much butter in the recipe to work with the amount of flour in it. Dough is way too sticky to work with. I put in the freezer and still couldn't get the first batch peeled off the parchment paper (with flour) to transfer to the cookie sheet. I have made cookies like this in the past and they were not that difficult. Absolutely delicious, and such a pretty and festive cookie for the holidays. The lemon compliments the taste without overpowering. Take the extra minutes in making these to refrigerate the dough (and cookie cutter) after rolling it out till firm, and at any point the dough softens, it makes for an easier cut and keeps its shape. This recipe is a keeper, and is now on my baking holiday cookie list! I substituted 1/4 c of cornstarch for 1/4 c of the flour, it's been my experience in baking cutout cookies that this helps stabilize the dough and helps the cookies hold their shape well without compromising flavor, since it's a small amount. I had no trouble rolling out the dough after it was chilled, it rolled easily with very little additional flour. 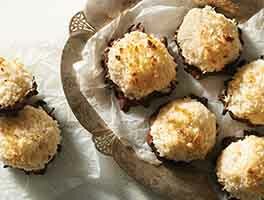 Wonderful recipe, nothing but complements on the cookies. Will definitely make again.